The anti-GOP wave that upended Congress rewarded Democrats with new opportunities to help set the national agenda — and burdened them with the task of delivering on voters expectations. "Time for a change," Sen. Harry Reid of Nevada, who likely will become the new Senate Majority Leader next year, said Thursday at a victory rally outside the Capitol. "This country has spoken loudly and clearly." Between their promise to increase the minimum wage and their vow to seek a new direction in Iraq lies the difference over what is achievable and what might fall beyond their reach. "Simply having the title of majority is not enough," said Sen. Richard Durbin of Illinois, the second-ranking Democratic leader in the Senate. "It's a long litany of challenges before us." Reid and Rep. Nancy Pelosi, the would-be Speaker of the House, savored their victories on Wednesday but struck conciliatory tones, promising to work in a bipartisan way with congressional Republicans and the president. 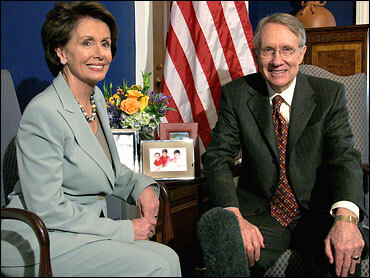 "This is not a juggernaut just slicing through town," Reid said. Pelosi and President Bush have had a contentious relationship. However, though strained smiles, they tried to get the message out that they were prepared to work together after a luncheon meeting at the White House on Thursday, reports CBS News chief White House correspondent Jim Axelrod. "We won't agree on every issue, but we do agree that we love America equally, that we're concerned about the future of this country," Mr. Bush said. Democrats won the slim 51-49 majority in the Senate with the victory of Democrat Jim Webb over Republican Sen. George Allen in a hard-fought Senate race in Virginia. Allen was told by his advisers that the numbers just weren't there and a recount — which could have dragged things out for weeks — wouldn't help him, CBS News Radio correspondent Bob Fuss reports. Allen conceded on Thursday. With some races too close to call, Democrats held 230 seats in the House, 10 more than a bare majority. They appeared to be in line to win two more. For Democrats, winning control of both chambers of Congress raises the stakes. Besides hiking the minimum wage, they want to act quickly on legislation to enact recommendations of the 9/11 Commission, to reduce dependence on foreign oil, to expand stem cell research and to reduce the price of drugs offered through Medicare. All those pose potential legislative challenges, but none more than the Democrats' pledge to seek a new direction in the war in Iraq. Surveys of voters conducted on Election Day showed that almost three out of five disapproved of the war and were more inclined to vote for the Democratic candidate. Only a third of voters said the war had improved the long-term security of the United States. Still, the strategic course of the war is set by the president. Congress has little leverage to force the president to change course. Mr. Bush sent Congress a signal on Wednesday when he announced he would replace Secretary of State Donald H. Rumsfeld. The change, Mr. Bush said, would provide a "fresh perspective" on the war. Recognizing Congress' limitation, Pelosi said that when it comes to Iraq, "it's not about the Democrats in Congress forcing the president's hand." The first test on the war for Democrats could come next year when Mr. Bush sends Congress a spending bill to pay for operations in Iraq and Afghanistan. Democrats have said they will not hold war appropriations hostage in exchange for policy changes. Instead, they are hoping Mr. Bush will heed the results of the election and the upcoming recommendations of a bipartisan Iraq study group led by former Secretary of State James Baker. "The president is the president of the United States," she said. "I hope that he will listen to the voices of the people and, again, putting aside partisanship and looking to a partnership to end this war." Even with a majority, Democrats can't count on passing everything they want, reports CBS News correspondent Sharyl Atkisson. As a minority, Republicans can always filibuster in the Senate, and the President still has his veto pen. Democrats in the House would be unable to override a presidential veto on their own, and it only takes 41 senators to filibuster legislation. "The minority, as long as it has more than 41 people together, can have a great deal of impact on whether something passes at all, or, if it passes, what form it takes," said Sen. Mitch McConnell of Kentucky, who's in line to become the new Senate Republican leader. Some Republicans cautioned against an obstructionist approach. "If we do that, shame on us," said Sen. George Voinovich, R-Ohio. "If the Democrats do what I would do if I were them and reach out with a list of things to do, and if we're depicted as standing on the outside trying to prevent that from happening, it would be terrible for the country. And it's stupid politics." Democrats already were offering to cooperate when the House and Senate reconvene under Republican control next week for a post-election session. The agenda includes unfinished business on legislation ranging from offshore drilling to a nuclear agreement with India to tax incentives for the production of alternative energy. Also unfinished, however, are 10 spending bills needed to keep the government operating. Officials said it was possible lawmakers would simply leave final action on those bills to the new Congress. That would saddle Democrats with the task of tidying up the past when they would rather be looking to the future.